"Königreich Der Angst (Collector's Edition)"
For some years they shrouded themselves in silence: they could have been regarded as dead. 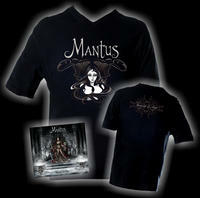 But quite evidently Mantus put the time to good use, as only a short while after the release of their resurrection album, "Requiem", they add fuel to the fire with the EP "Königreich der Angst". An EP which with eight new songs, two remixes (including from Black Heaven) and 43 minutes playing time almost reaches the length of a full-length album. Musically and lyrically Mantus consistently continue that which they began on "Requiem" and in doing so remain true to themselves. With the high quality which is to be expected, metallic guitar riffs mix with classical arrangements, piano chords with electronic drums and expressive melodies with sacral hymns to make a kind of dark romantic symphony, crowned with the perfect alternation of male and female vocals. Martin Schindler and Thalia have once more created a gem which perhaps comes across as being more melancholy in tone than "Requiem", but without disowning the rock elements. "Königreich der Angst" demonstrates clearly to us all what a shame it would have been if Mantus really had disbanded.